So today I thought I’d show you my 3 must have staple wardrobe items. They are probably no brainers if you’ve been following my blog for a while because they frequent almost every single post in some shape of form. While things like LBD’s and jeans are always hailed as wardrobe staples and I have to agree, there are a few items that my wardrobe would be incomplete without. I truly believe everyone should have at least one striped tee in their wardrobe. Chic, easy to style, versatile and are the perfect item to wear when you’re not sure what to wear. Stripes are a really neutral wardrobe item as well as they can be paired with pretty much any colour. Plus you get 10 Parisian points! Personally I think you can never have enough and I've never met a stripe that I didn’t like. A while back one of my friends told me that they hadn’t seen me without a Fedora in about 6 months. It’s probably true actually because I was straight up addicted to them and I have a tower of them in my room to prove my point. I don’t know why I like them so much, maybe it’s because Im so lazy with my hair but I just like the vibe they add to my outfits. They are warm and add a certain something to an outfit. Fedora wearing tips - If the brim of the hat is small, wear the hat more tilted towards the head with the front of the brim sitting on your forehead. With wide brim fedora’s wear them right on the top of your head. My Forever 21 faux leather jacket has been a staple in my wardrobe for so long. I’ve actually had two of them after I lost one on a night out and then in some twist of fate I found one a year later in F21. These go with pretty much everything and are something that just take an outfit to the next level. I love pairing mine with girly dresses for a mix and match rock chic look. Yeah I just cringed at myself for writing Rock Chic. No one should ever say that ever. To my wardrobe essentials are belonging striped tees, too! And for sure also my black leather jackets and my hats :) You look very stylish in your look! Yep, striped tee is a must. Or anything with stripes for that matter! Seems to go well with most outfits! I totally agree with you! A stripe top is a must have in my wardrobe!! Great staples, your outfit looks lovely! I live in my fedora's too. I just have gotten so used to wearing them, I feel naked without a hat haha! I love stripes so much, and like you, my faux leather jacket is my def top 3 of my must haves. Totally agree with all three! So many stripes and leather jackets in my wardrobe. Can never have too many, right? Going to throw a 4th one in the mix for you being those elusive leopard print Topshop(?) flats back in the day! These are all my wardrobe essentials! Everyone goes mad at me for how many striped tops I buy! All of your style is awesome! I love my leather jacket, I don't know what I'd do without it. I don't know how anyone cannot have a leather jacket! Yes. So much. 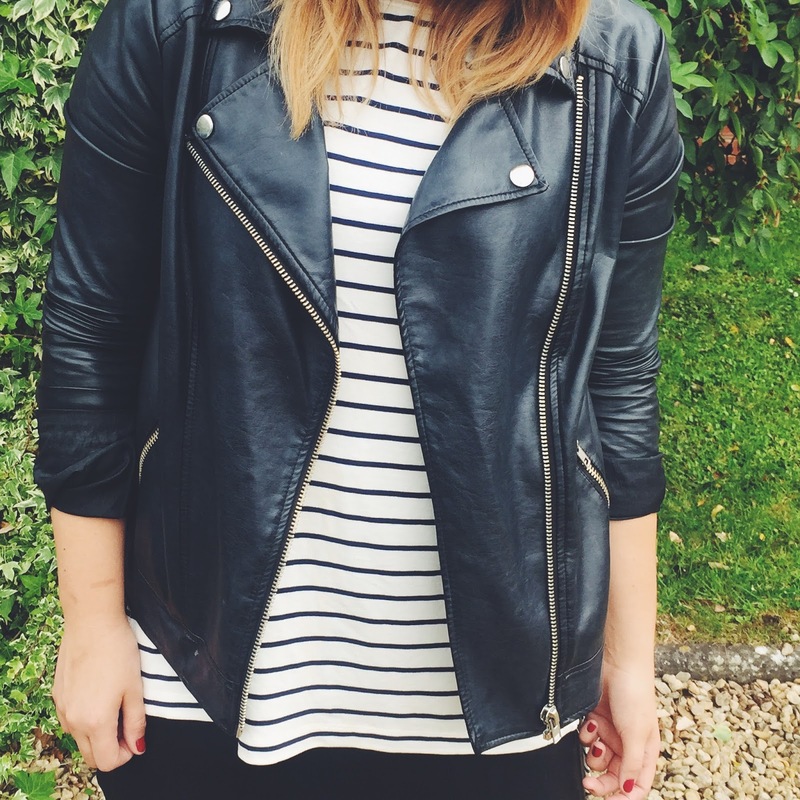 Nothing is better than a striped tee and a leather jacket! I agree, only I always feel self conscious in a hat and had one blow into the road a few times which isn't great. I have far to many striped tees and my leather jacket pretty much worn out from use. Stripes are my absolute #1 staple. I'm still looking for my perfect leather jacket though. Haha I agree with everything but the fedora. Hats look awful on me. But a good leather jacket is my number 1 essential! I splurged on one last winter and I've been looking at it every day because I can't wait to wear it again! I've never tried any of these but I think my style essential would be a bow, comfy sandals and a pink blazer. You do make me want to try a fedora gat though. Totally in agreement with the jacket and fedora, I love mine! I never leave the house without a striped tee! I love that you keep it simple, yet sophisticated. Definitely my style! great essentials, can't argue with you on any of them! I am always attracted to striped tees, no matter how many I accumulate! A leather jacket for me is an essential! 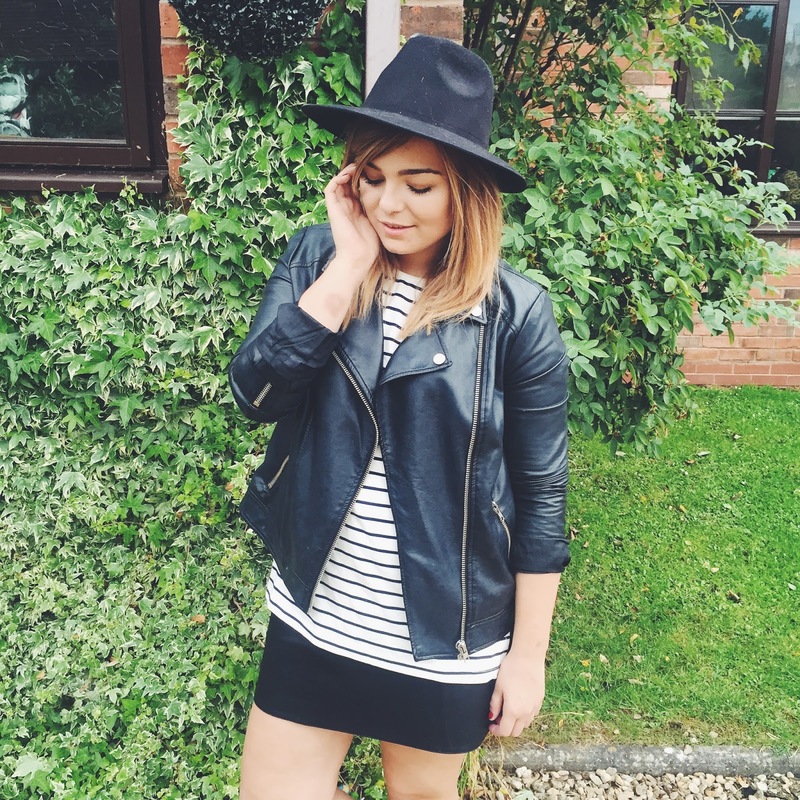 I LOVE the biker jacket, I'm so tempted to buy one now from Forever21, great post Lily. In the winter, my leather jacket is my essential too! These are my essentials too! Love your look! Couldn't agree more - stripes are my life! I'd say my wardrobe staples are a striped t-shirt, a cashmere jumper and a good pair of black skinnies! I too am a bit addicted to fedoras... I (wrongly) like to think they make every outfit look instantly cool, no matter how casual/crap. Three great essentials there! I love the jacket, I never even guessed it wasn't real leather! Reading this post I cannot believe that I don't actually own a striped tee!!! I WILL FIX THIS RIGHT AWAY! I'm off to buy one:') I'm so shocked that I don't have one I thought I did! Great post yet again and you've inspired me for tomorrow's Think Like a Blogger post! Thank you! Stripes is a definite staple in my wardrobe - I just wish fedoras suited my pea head! Striped tees are so versatile and can be worn in lots of different ways - I love that! I own nothing but stripes!!! They go with anything and everything! I don't think I could live without my leather jacket! I don't think I'd be able to live without striped tops, they always save the day and I practically live in mine! A leather jacket is a wardrobe staple for me, it is so easy to make an outfit with one! yes to all of these things, I wish I could rock my fedora more though! I love stripes and leather! They give so much attitude and character to an outfit! Love the stripes and leather. I love hats, just maybe not on me. I keep trying though! Completely agree with you with those! A leather jacket is super important! Magic Look My Dear Lily : Striped Tee & Fedora & Leather Jacket Are a Nice Mix for an Amazin' Outfit ( and Your Beauty...). Hugs & Kisses , Lots of Love !!! With you on the breton top and leather jacket, not a hat person myself but love it on you. I totally agree, these 3 are a must for a stylish wardrobe! Striped tshirts and leather jackets definitely feature in my top 5!! I'm currently saving for (amongst other things) a real leather jacket that feels jusssst right. I feel like I'll wear it forever!